Chef Tony Ni at his sushi station at the Lookout Tavern. 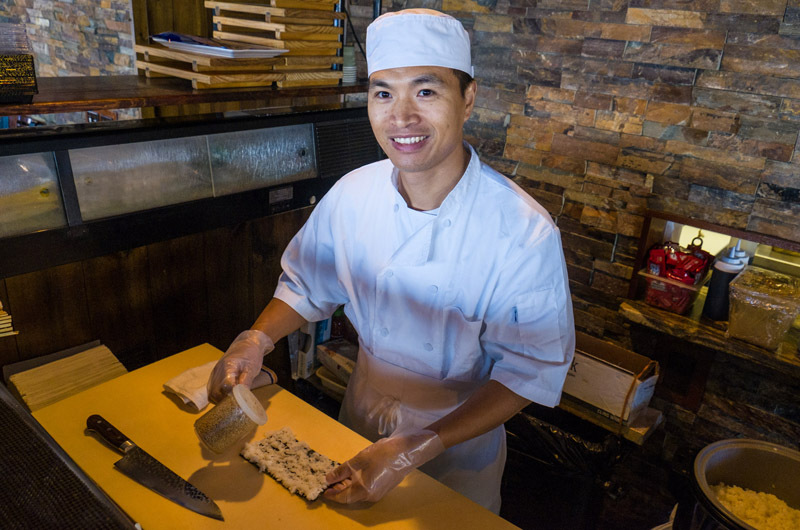 When encountering a Vineyard sushi bar, one will find raw fish, rice, seaweed, and, most likely, Chef Chunxiang Ni, known to most as Tony. Mr. Ni has been rolling sushi for seven years on the Island and his work can be found everywhere from the Net Result to Rosewater, the Lookout Tavern, and on one occasion Edgartown Meat and Fish. On a recent morning he was stationed at the Lookout Tavern, where he spends most of his time, finishing the prep for the day’s sushi bar. 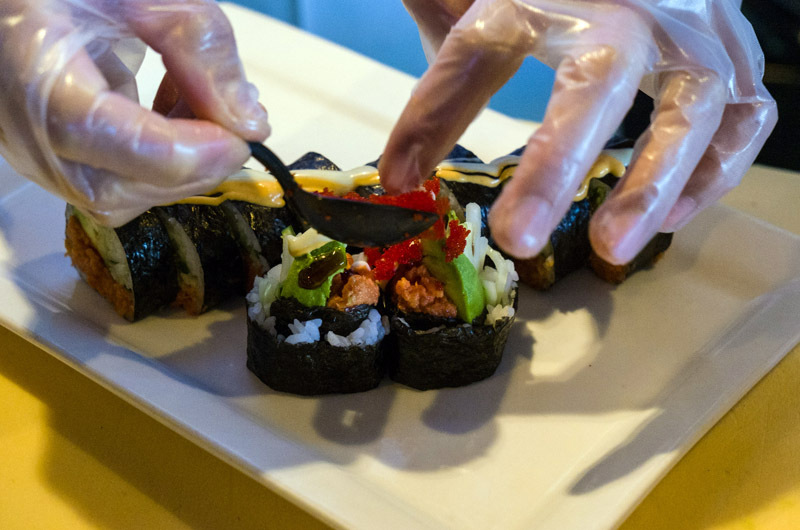 His hands were a blur as he diagonally sliced avocado quarters, laying the thin pieces over a dragon roll (tempura shrimp, seaweed, rice, kabayaki sauce, sesame seeds, avocado), and wrapping thick cuts of fish in saran wrap. “People always call me Crazy Tony Sushi Chef,” he said, jovially, while his assistants prepared the vegetables for the rolls. As the master behind the bar, Mr. Ni never has to prep vegetables. But it wasn’t always that way. It took nearly five years before he was allowed near the fish. Rolls (maki) are the easiest, though spreading the rice evenly can be tricky. Then there is sushi (raw fish on a small mound of rice) and sashimi (thinly sliced raw fish). Though they look simple, they are the most difficult to master, Mr. Ni said. Mr. Ni grew up in China. In 2005, at the age of 24, he moved to Manhattan in search of better job opportunities. He arrived with no money and no real idea of how to make a living. A friend suggested he try to find work at a Japanese restaurant, promising it would be easy work and easy money. “It was not easy,” Mr. Ni said with a laugh. And yet something about making sushi felt right. The feeling stayed with him through years of side work. It stayed with him through learning how to delicately slice fresh fish, and the connection continued as Mr. Ni found his way from New York to the Vineyard. On the Vineyard he met Steve Loo, an Island sushi institution. 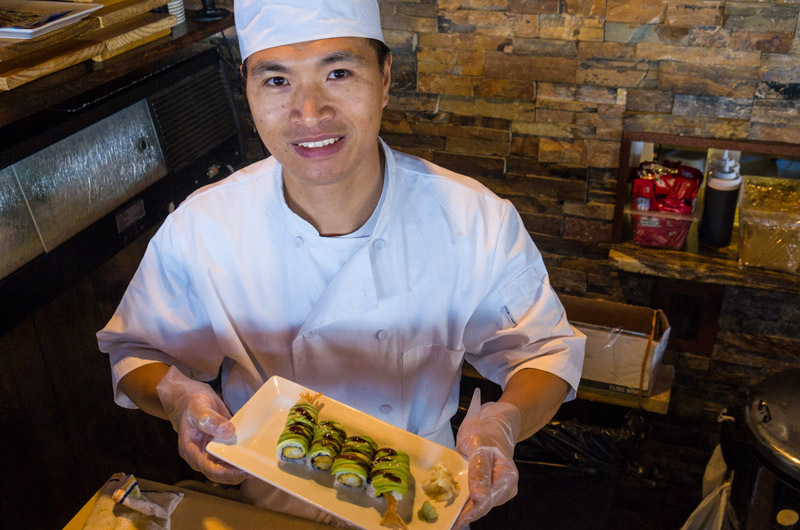 Mr. Loo was previously the head sushi chef at the Lookout Tavern and had over 25 years of sushi experience. He told Mr. Ni that every sushi bar is different and introduced him to the different ones around the Island. “Everybody knows sushi chef Steve Loo,” Mr. Ni said, calling him a superstar. Mr. Loo now lives in Connecticut. Under Mr. Loo, Mr. Ni honed his craft. He said he mastered the art of sushi about six years ago. Cutting fresh tuna is the hardest part of his job, he said. Making sushi requires more than nimble hands and fresh fish. It requires a sort of passion that embraces long hours and difficult techniques. “My teacher say if you do not like your work, [and do it] just for the money, you will not do a very good job,” Mr. Ni said. He finds joy in his work, especially in the colors of raw fish and the accoutrements. One of his favorites at the Lookout is the Mango Tango (spicy tuna, avocado, really fresh mango, mango sauce and fish eggs). From spreading the rice to slicing the fish, everything behind the bar is technical. At the same time, Mr. Ni understands the subtle dance between beauty and taste. For him, a roll that looks beautiful but has no flavor has no place on the menu. And to make sure the sushi makes the cut, Mr. Ni tastes everything. In this way Mr. Ni builds relationships with his customers, able to suggest a healing cup of miso soup or a brilliantly arranged roll. For the first several years of his career, Mr. Ni devoted all of his time to sushi. He’d arrive early in the morning for prep and stay late into the night. Then, a little over two years ago, he and his wife Feng Zheng, known to many as Sandy, had a daughter. Their daughter was followed a year later by a son. Now Mr. Ni tries to balance the fast-paced sushi world with fatherhood. In the busy summer season, when he comes home late from work, his young daughter is often still awake, fighting sleep, and able to welcome him home. Mr. Ni takes a break in January and February when the sushi business slows. His parents now live in Brooklyn, though he hopes they will come to the Island to live with him and his wife. In a couple of years, he wants to take his family back to China to visit his 85-year-old grandmother, whom he grew up with. But Mr. Ni says he will always return to the Vineyard. It’s where his job is, it’s where his family is. Beautiful story on an untold area of expertise on our island. Wonderful writing and pictures. thank you for sharing!